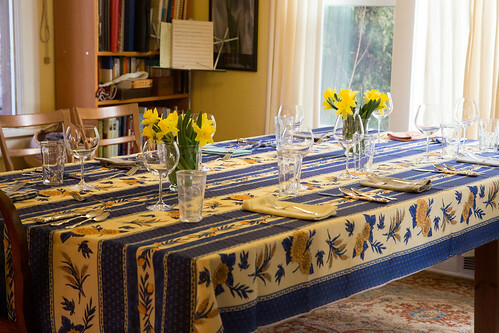 It was our turn to host supper club, and we chose a theme that we thought would be welcome during these cold gray winter days: Southern cooking. We kicked things off with an experimental cocktail called the “Deep South,” which was maybe a bit too sweet – rum, molasses, pineapple juice, and a little cherry-infused rye, with a squeeze of lime. 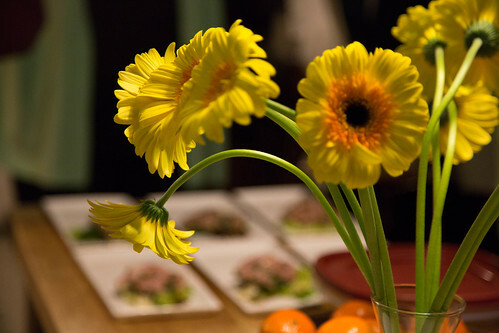 We might not make that one again, but it was fun to stand around with mason jars full of rum, like a taste of summer. 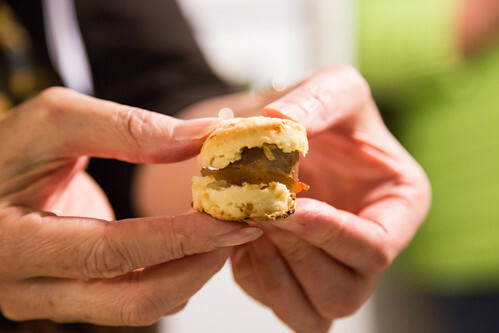 The drinks were accompanied by Linda’s wonderful tiny buttermilk-and-caramelized onion biscuits, slices of andouille sausage, homemade mustard and pickled watermelon rind with clementines. The dog, who was a little unsure about all these people, still made sure to stay underfoot in hopes of a dropped biscuit or two. 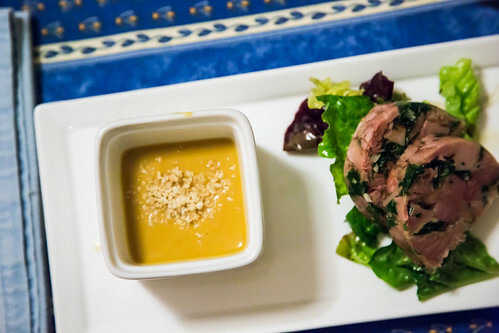 Our first sit-down course was a small cup of cold peanut and sweet potato soup from Jenise, plus a terrine of ham and collard greens in a bourbon-flavored aspic. 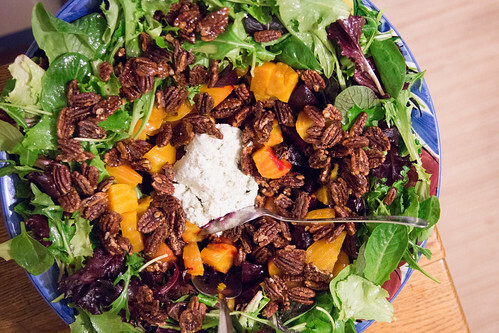 Georgiann assembled a gorgeous salad of greens, roasted red and gold beets, spicy candied pecans, and a cloud of whipped blue cheese, with a champagne vinaigrette. 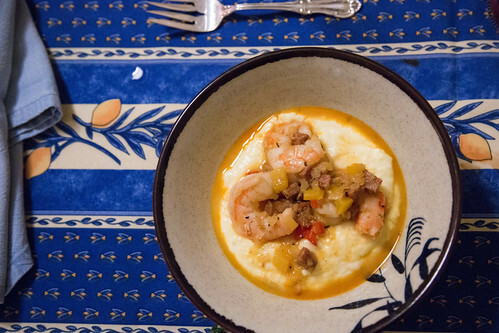 I made shrimp and grits (which was basically my whole reason for deciding on the Southern theme to begin with). I love all versions of this dish, but the recipe I used was from James Villas’ Glory of Southern Cooking. 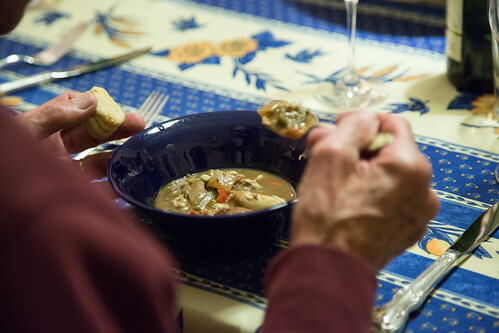 The shrimp were cooked in a sauce of onion, bell pepper, andouille sausage, chicken broth and a little cream, ladled over grits cooked for an hour with plenty of butter and half-and-half. 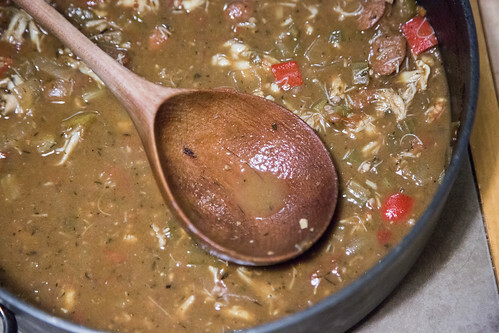 After that we moved on to gumbo. Roger and Mary brought this, and it was full of sausage, crab and oysters. 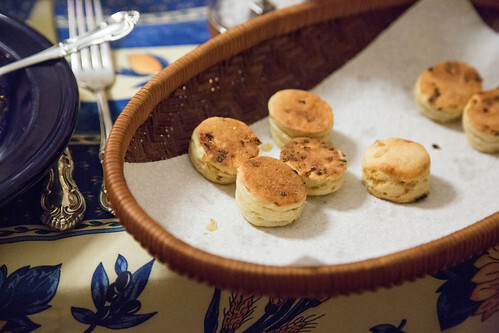 By this point in the evening I could hardly do it justice, but it was excellent with more of the little biscuits. 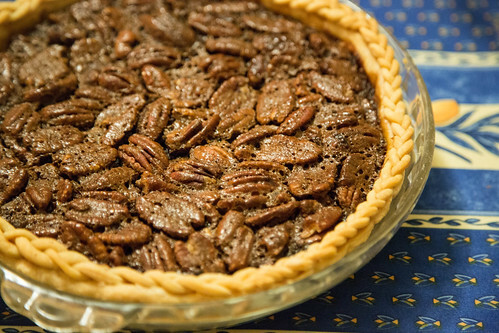 Finally, for those with room to spare, there was a chocolate-pecan-bourbon pie from Linda, with an astounding braided crust. Sazeracs made a perfect accompaniment. 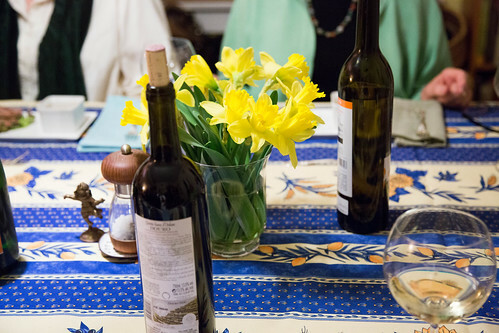 There was plenty of wine and lots of laughter. Next > what’s going on here, anyway? Wow. gorgeous, all of it. you guys….